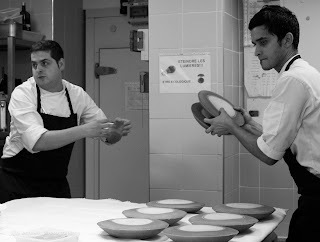 There are two kitchens at Le Mirazur. The cold kitchen and the hot kitchen. There's a connecting door which is always closed except when food is being taken through for the restaurant. It's getting busy in the cold kitchen with dishes being prepared by members of Chef Mauro's team. I kept diving into corners, trying to keep out of the way. Il y a deux cuisines au restaurant Le Mirazur : la cuisine froide et la cuisine chaude. Une porte communicante les sépare, toujours fermée, sauf au moment où les assiettes passent en direction du restaurant. 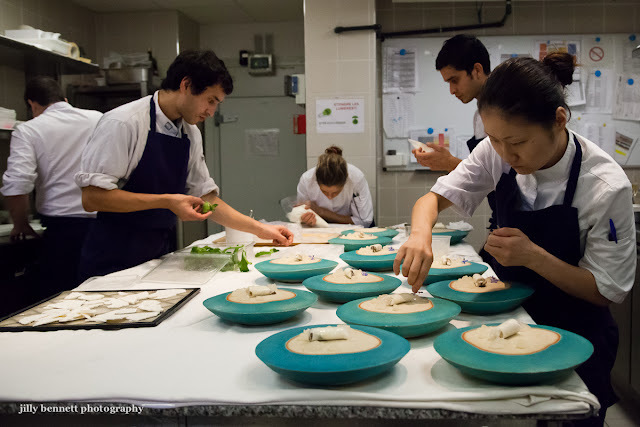 La cuisine s'anime avec les plats froids préparés par les membres de l'équipe du chef Mauro. J'ai continué à me glisser dans les coins, en essayant de ne pas gêner la circulation. Oh my gosh, I'm so jealous! What a fantastic opportunity. These photos are just sheer perfection.